To get the certificate, a company must accomplish 3 conditions: quality, sustainability and traceability of biomass. Certification get companies which produce solid biofuels or trade with them and are committed to obey the rules and conditions of certification system BIOmasud®.We are lucky to announce, that first Slovenian company Biomasa d.o.o. 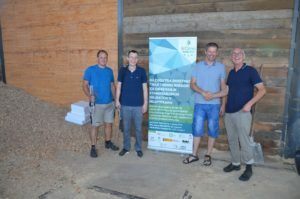 implemented the certification scheme for the production of wood chips. Biomasa d.o.o. is one of the biggest producers of wood chips in Slovenia and that is why it is even more welcome that big part of wood chips on Slovenian market will be certified with BIOmasud® label. After the first audit, they improved the quality of their wood chips, traceability of biomass and implemented regular control of wood chips quality. It was anticipated that Biomasa d.o.o. will fulfill all criteria till autumn 2018 and like expected, in September 2018 wood chips of quality class A1 from Biomasa d.o.o. got certified with the BIOmasud® certification scheme. After second audit in august, no major non-conformities were noticed. Wood chips were very good quality, traceable and sustainably provided. To achieve quality for certification different standards were considered. Biomasa d.o.o. is a company which main activity is processing wood for energy purposes. They have powerful machines and can produce around 170.000 bulk m3 air-dried wood chips annually. They invested in additional capacity of 80.000 bulk m3 of technically dried wood chips per year. They also produce around 3.000 tons of pellets annually. To maintain quality of wood chips with BIOmasud certificate testing of certified biofuel will be performed once a year. Certificate is valid for 5 years. During this time, revision of quality by certification body will be performed once per year. Every producer should also establish internal control to make sure all series of production are the same quality and in accordance with standards of BIOmasud® certification system. The best system for internal controlling is to take and test sample every shift, depends on extension of production (smaller producers should control once per series and bigger producers few times per shift) to avoid bigger manufacturing errors. We congratulate company Biomasa d.o.o. for being the first company with high quality certification BIOmasud Plus. We want to encourage others to join to certification scheme BIOmasud Plus to offer products with high quality, sustainability and traceability.